The happy couple continues with their lunch as I rumble through. In preparation for my birthday climb of Pyramid this past year, I did some trail running around the area. This shot was taken on Difficult Trail, just outside of town as you head up Independence Pass, after “camping” with a big group of friends (not exactly roughing it) the night before. Apparently, these deer were hard of hearing, because I could not have been all that quiet! 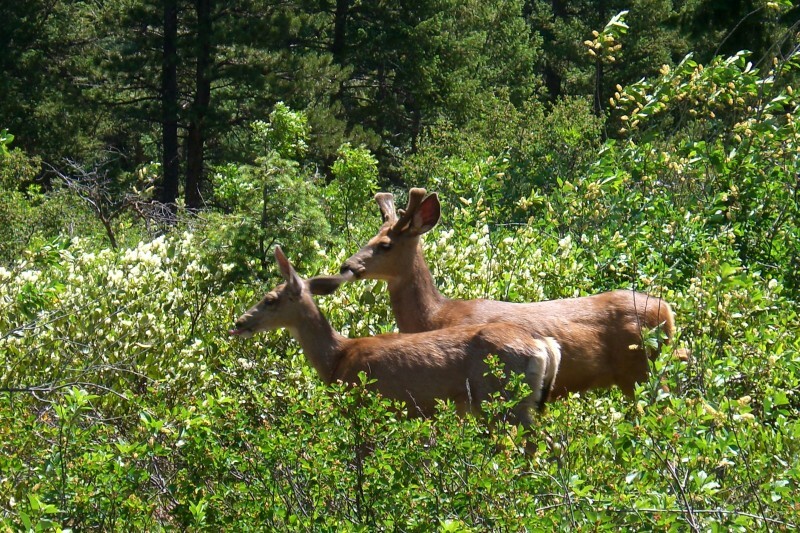 I saw them immediately as I came upon this clearing, and slowed enough that they didn’t bolt, but just kept grazing; so I was able to get a pretty close-up shot. This entry was posted on Tuesday, December 2nd, 2008 at 11:29 pm	and is filed under wildlife and tagged with wildlife. You can follow any responses to this entry through the RSS 2.0 feed. You can leave a response, or trackback from your own site.